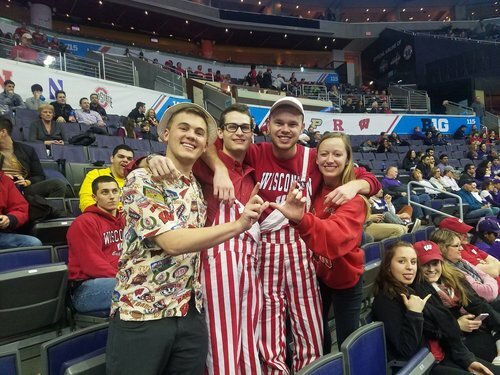 Wisconsin fans cheer Julia Louis-Dreyfus because they are normal people. Game over in Madison - @BadgerWHockey wins 7-0 and advances to play Boston College next weekend in St. Charles, MO. The manager just dumped Gatorade all over Greg Gard. Badgers up big, but that seems premature. Northwestern with its first two points off a turnover!!! Yea... that kid is NICE! Northwestern has cut it to 25. Double-double for Nigel Hayes with 16 points, 10 rebounds for the #Badgers . Double-double for Nigel Hayes. 18 points, 10 rebounds. With Wisconsin up 27 and 6:18 to play, starters are still on the floor. Interesting choice. Disregard that last one. Just Hayes and Brown on floor. Trice, Hill, Illikainen in. #Badgers 71, Northwestern 41 with 3:48 left. That is not a misprint. I think. Good to see Wisconsin will even its record against Northwestern to 1-1 this year. With 3:48 left, Trice-Pritzl-Moesch-Hill-Illikainen on the floor. Badgers up 33 after three-pointer from Prtizl. Moesch-Hill-Thomas-Schlundt-Van Vliet in for Wisconsin. 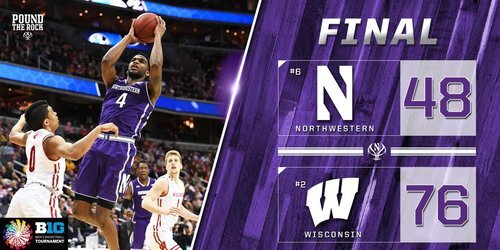 Final: #Badgers 76, Northwestern 48. 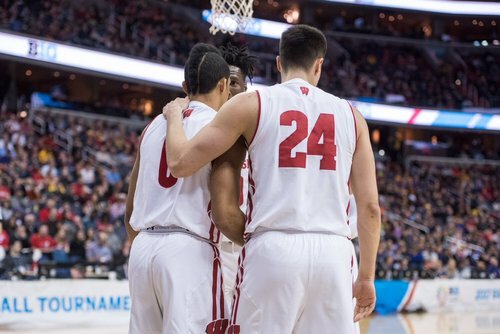 Nigel Hayes with 18 points and 10 rebounds to help send UW to the championship game against Michigan. Tomorrow, we play for a title. In the post game handshake line, Chris Collins just asked Greg Gard: "We good? We good?" Looking ahead to tomorrow's B1G final - Wisconsin beat Michigan 68-64 in Madison in January and lost at UM 64-58 (without Koenig). FINAL SCORING: Hayes 18, Happ 16, Showalter 10, Brown 8, Koenig 8, Trice 6, Hill 5, Pritzl 3, Illikainen 2. Badgers shoot 47.4% overall. Heck of a run this week at the #B1GTourney . More to come. #Badgers 28-point win is their largest in a #B1GTourney game. Postgame presser starting now. Collins says big difference for Wisconsin was the “hustle stats.” Credits Badgers for rebounding, Pos, etc.